This is a day that is important in our history. I read a few blogs today that have called us to reflect on the words of Proverbs. After reading them I wrote this column for the Tribune for this Thursday. I write this at a very historic moment. American President Barack Obama has announced the killing of Osama Bin Laden. This is one of those moments where you remember exactly what you were doing when you heard ‘the news.’ To say that I was astonished would be an understatement. Osama Bin Laden had been on the FBI’s most wanted list for nearly 10 years. Since 9-11, another of those remember when days, he has been the most hated man in America. Some believed that this very rich man was living in cave in the ‘no man’s land’ between Afghanistan and Pakistan. There were others of us who felt strongly that he was living comfortably in Pakistan or somewhere friendly. It turns out that his compound was quite comfortable indeed. The pictures that have emerged this week make it difficult to believe that the government of Pakistan, an American ally, did not know where Mr. Bin Laden was. All of the debate and conspiracy theories have now begun, and questions abound. This will no doubt become a part of the political discourse in the months that remain between now and the next presidential election. There is, and will be, much chatter and dubiety about what happened and what did not happen in Pakistan on May 01, 2011; one thing is clear – Bin Laden is dead. President Barack Obama took great care to point out that this action was taken against an enemy of not just America, but of most of the civilized world. He noted that many Muslims would also welcome Bin Laden’s demise as his violence and hatred have resulted in deaths of many Muslims as well. I was impressed that the Americans took care to treat his body in proper accordance with Muslim tradition. His body was cleaned, wrapped in a white sheet and he was given a burial at sea very shortly after his death. These are the marks of being a civilized people. President Obama’s remarks were careful and respectful of the situation. Care must be taken that our society and our culture is defined by something better what that which we fight against. That brings me to the quote cited at the beginning of this column. Pope John Paul II, who was beatified this weekend, met with Mehmet Ali Agca, the man who tried to kill him in 1981. This picture was taken 2 years after the assassination attempt. While I also found the joviality of Osama’s demise disturbing, I think there’s a difference between “merry-making” and being glad, which you seemed to collapsed into one in your blog. It is not un-Christian to be glad when someone who has caused so much terror and destruction encounters some form of justice. If anything, it is human. But, I would also say that there’s a difference between gladness and dancing on someone’s grave. Of course, there actually are some scriptures that actually support all out celebrations in the midst of an enemy’s demise, depending on which passages we prioritize (I don’t prioritize those), for whatever that’s worth. Furthermore, from the perspective of the oppressed, why should they not rejoice at the removal of their oppressor (not to say that the U.S. as nation is the oppressed)? at the very least it must be ok to be glad, no? otherwise, that would seem to me inhuman, and the one saying, “don’t be glad,” would smack of having the privilege to say that. I’m not accusing you of all these things. I am just pointing out the implications of your statement, especially in other contexts, for which you are not alone based on all the status updates I have observed. On another note, I would also press you to refine what you mean by civilized, because whom am I to assume you are excluding from the “civilized” world? If Osama was a threat to not just the U.S. but all the civilized world, is there somewhere or someone he is NOT a threat to? I do stand by merrymaking as it is defined to be a festivity and a revelry … seeing people raise toasts with champagne and beer is not merely being glad. It was evidenced over and over again in city after city and I find that disturbing to be honest. It really did look like dancing on a grave – I never thought of those words but they are apt. I did not go into the headlines that I read today from many major us publications which are also quite troubling. Now …you seem to equate removal with killing…ie ‘removal of the oppressor.’ I sure do accept that the oppressed should be glad when the oppressor is ‘removed.’ I am not so sure that the oppressed should be glad at the killing of the oppressor……..these are difficult questions but they go to the heart of what we profess about dignity for all people and for love of even those who are the enemy. I would press you to tell me who the oppressed are as well….and again I am not suggesting that there are not oppressed here…however many of those partying (yes that is what was happening in many cases) may not be among the oppressed of which you speak…I could be wrong here. perhaps my use of the word ‘civilized’ was unclear…In the West we describe the behavior of Bin ladens and other extremists and terrorists as uncivilized. I don’t believe he was a threat to those who support such terrible and indefensible behavior – when we dance in the streets we look like those who dance in the streets for all the wring reasons. I want to be clear, I think the world is a safer place today with the death of OBL. My concern is with what our behavior says of us when we rejoice in the violent death of an enemy. For ‘me’ that is simply inconsistent with the baptismal covenant. Response to your response from Frank’s facebook… This will probably only make sense if Kevin posts his response from facebook onto here as well. I actually was not disagreeing with your point on the “merry-making.” I agree with that part and as I stated, I also found the prancing around the streets and such equally disturbing. I was simply noting that in your blog, you seemed to collapse “gladness” and “merry-making” into one and the same, and they are not. As for the equating of removal and killing, I do not equate them as the same thing, but whether one was removed peaceably or through violence, he was removed. I believe people would have been prancing around even if he were caught alive, but that’s just speculation. However, that’s besides my point, and I think you’re right to parse out whether there can be gladness at removal as opposed to killing. However, if one is glad about the removal of Osama, that would mean one would have to include if that were to happen violently. I am not talking about “prancing on another’s grave,” which, again, I also thought was disturbing, and we have no disagreement there. However, I believe one CAN be glad, even if someone like Osama was removed violently, but to be glad does not equate to merry-making, which is my point. It is inconsistent to say you’d be glad if Osama was removed but not glad if he was killed. Whether through capture or killing, that is removal, and of removal one CAN be glad. I also made clear that my point about those who were oppressed being glad did not mean that I was referring to the U.S. as the oppressed. I was stating that if your comments about being glad was a blanket statement of what is Christian behavior or ethics then it falls flat when applied to circumstances of an oppressor being GLAD that their oppressor is gone… Perhaps even rejoice. My point is that I as one who is not of the oppressed community can’t be the one to dictate that oppressed community is barred from being glad that their oppressor has been removed, whether violently or peaceably. Otherwise, that IS speaking from privilege. In other words, hypothetically, it is one thing for Gandhi to tell Indians, do not be glad at the assassination of the British monarch, but it is another thing if I, a non-Indian not under the yoke of British colonialism and having suffered for it, tells the Indians, do not be glad. Regardless, I would press to ask, why one couldn’t be glad even at the violent overthrow of oppressor? To come all the way back to the original point, gladness does not equate to merry-making and gladness is not mutually exclusive from acknowledging tragedy. As a Christian, I am glad that a mass murderer and terrorist is dead, but I am not merry-making and I fully understand how tragic it is that he was killed. So I would ask you again if you still hold gladness to be the same as merry-making. If so, we come at an impasse. If not, then you must see how one can be glad, and not prance around, and still take to heart the tragedy it is to take a life so violently, even an enemy’s. As for your response regarding who is “civilized” and not, I did understand what you meant, and I probably should not have asked rhetorical questions to make a point. However, you did clarify for me what you meant. The point I meant to imply was that your use of the word “civilized,” is unnecessary or at the very least inconsistent in itself. If the differentiation of civilized and uncivilized is violence, how is the U.S. or the “West” more civilized than any other country? Thus, if the criteria of “uncivilized” is violence, then it would seem to me Osama is a threat to all, whether “civilized” or “uncivilized,” since even the violent “uncivilized” must contend with another’s violence. Therefore, “civilized” simply carries no meaning unless one is trying to make someone or some group an “other,” in which case, does that not inherently lead to justification of the violence which you deem “uncivilized” or at the very least a gladness in his violent death? With regards to the baptismal covenant, are we not called to reject spiritual forces of wickedness? That is in our Methodist liturgy, I don’t know about your tradition, but I would assume so. In such a case, is not violence, though never good and never desirable, in this fallen and broken world, the lesser evil of two possible options: killing a mass murderer or allowing the masses to be murdered? 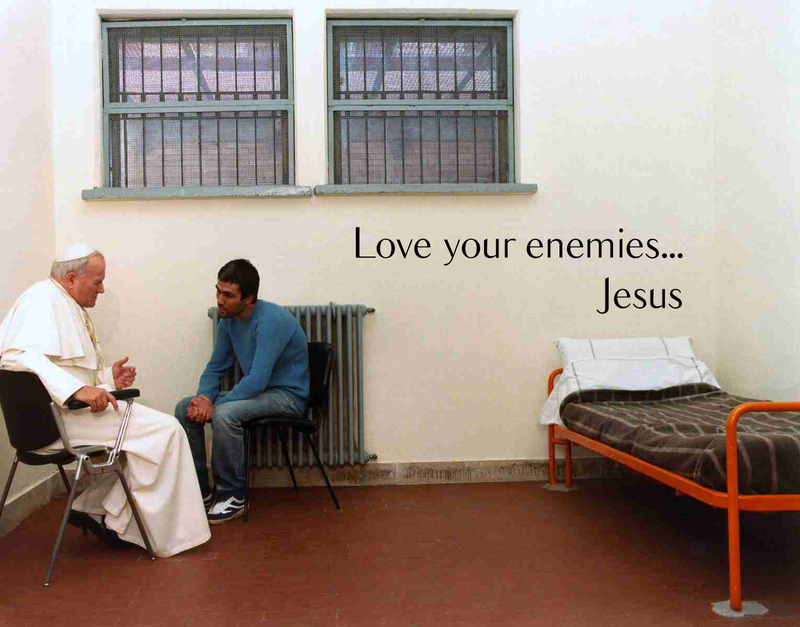 In a circumstance like that, which is loving my neighbor and rejecting the spiritual forces of evil. While I sincerely advocate for non-violence as the first option, unfortunately, in this world, sometimes that option is taken away from us. That is why the more pressing problem, at least in the U.S., is that just war is taken without any seriousness. War and violence is the FIRST option, and THAT most definitely goes against the grain of what we as Christians desire and have affirmed in our baptismal covenant. Maybe I should start my own blog. I will apologize in advance if I don’t respond again, which does not mean I will not read what you have to say. It just means I’m too pooped. My comments about merrymaking were about those who were merrymaking at this violent death. I agree that people can be glad at this turn of events, it is not the word I would use to describe how I feel about his demise, but it it approaches something like that I guess…perhaps relief might better fit for me. I suspect that we agree on much and disagree on some. I made no connection of one with gladness and merrymaking although I can see how you came to that conclusion. Either way, I am uncomfortable with gladness, joy, merrymaking, joviality etc over a violent killing. I have no issue with being relived that a mass murderer is no longer a threat to anyone. I agree that violence and war seems to be the first option when it should be the last, however I am pacifist enough that ‘just war’ is even a struggle for me. We are called to reject wickedness, we are also called to strive for peace and unity for all people and respect the dignity of every human being. Please understand that my musings are a working out of many questions that I have …not conclusive answers to anything…. Thank you for the well considered thoughts that you have offered through your blog. They have, for me, discribed the feelings I have carried since hearing both the news of his death, and the surprise that has been mine as I have both watched, and listened, to the response of others . . . toward OBL’s death. The world is a better place without him. There should be no doubt about that for all of us who live in this ‘civilized’ world. Yet, I don’t understand the arrogance of so many others regarding his death. I just guess it is that another text from Proverbs keeps coming to my mind. “Pride cometh before the fall.” Those are my thoughts. Hope all continues to go well for you with your studies. So great to hear from you. Indeed the arrogance of it all is troubling and we pray that folks come to a place of humility in all of this. I am trying desperately to get the thesis work done —- it has been a struggle. I need to get a proposal off in the next few days in order to move on to the work for the John Bell course – are you coming to it? That is the current plan. I pray! Hope to see you in a few weeks. Well Kevin, I think you managed to have the final word with Daniel. May I, a mere lay person, share my opinion and perhaps I will merit a response to my thoughts. I am glad that Osama bin Laden is dead but I do not think it appropriate for American citizens to form “mobs” to cheer in the streets. If perception is important, huge groups of people cheering even the death of a horrid man, look somewhat like the crowds of Moslems in Pakistan or Afghanistan who rejoinced when the WTC towers collapsed on 9/11/2001. It looks ugly. I doubt that the majority of these cheering American crowds would even identify themselves as Christians, but as a Christian I have great trouble with military might. As a born American I think that the United States has lost its way. “We” should not have started a war in Iraq or in Afghanistan and “we” create resentment in other countries when we impose “our” ideas of how their countries should operate. This is how terrorism is spreading and so many people in other countries hate the United States. This is a bit by way of putting the cart before the horse. Leave the Libyans and anybody else fight for their own government without the interference of the US and Canada and other allies. Then perhaps Canada and the Western world can concentrate on building more just societies for their own people and to come to the aid of peoples who request their aid. I choose to be privately grateful that there has been some closure and perhaps justice for the thousands of innocent victims of Osama’s several acts of murder. Thank you for your response Evelyn. I hope that I did not get the ‘last word’ with Daniel as I have been quite enlightened by his thoughts on here. I think my reply was only attempting to deal with ONE issue and that was about hordes of Americans cheering in the streets as though at a hockey game. “OUR” side won at last! It sounded to me that you are telling me that my point was very simplistic and “we have much bigger issues to deal with.” I do indeed admire those who have forgiven their enemies because we are taught as Christians that this is what we are to do. Easier said than done. I am sure that I would have a very hard time doing this. I can accept the apology of a friend who has wounded me but doubt I could unilaterally forgive an enemy who killed someone in my family. I am having a lot of difficulty with military might and especially when interfering in other counties just happens to conincide with that country’s oil. We are probably going to return to Ontario by the first week of June. We miss you too. you miss read my thoughts or I did not write them clearly Or I misread yours? Not sure which….but I did not see your response as simplistic at all…I was reaffirming the point you were making…or I thought I was…I thought you were indicating that Military might was an issue…if it is than it is a larger one than our response to the death of one….I also believe that there is much to discuss about the notion that we can just decide to take a life…no matter how despised that person is. Take capital punishment, I am not in favour it only because practically it never works – the rich will fly away while the poor is fried. But if we were able to execute the law without an element of prejudice; is a person less a Christian if he was to rejoice seeing his worst enemy receiving the very same judgement that God instituted in the first place? What would you have done if you were one of the fathers who lost his kid in 9/11; and here you are reading the news , the very same monster who took not only your kid’s life but also your own is finally eliminated. Would you have forgiven him at the very height of your pain just like Jesus did? I hope I would be like that – it would be hard to get there but that is where I would hope to be…. I see your point and so would I like to forgive my enemy at the height of my pain. And I know we have to ask for His sufficient grace so that we can forgive those who hurt us or our family. I cannot readily do it on my own because let’s face it, if I could, why would I need the Lord? Aside from all that, my argument is simple: If a person goes as much as throwing a party over the death of his #1 enemy, would he be less a Christian than you and me? What does it mean to be a Christan, really? The Lord says: if you are guilty of one of his decrees, you’re guilty of them all. We have taken for granted some of the obvious violation of his laws: we lie, we cheat our taxes, we gabfest and yet we get bent of shape when we see a Christian jumping in euphoria over the demise of a monster. Did I mention hypocrisy is also a violation of his decrees? I agree with you 100% – but I would even take this further. If the U.S. was ‘civilized’ they should have given him a proper trial for his crimes against humanity. Hunting him down and killing him goes again all that is ‘civilized’. Yes – there is no doubt in my mind that he was guilty of his crimes – but I also feel that they should have set the example and had a proper trial for him. I know that having him in the U.S. would have been impossible – but I’m sure that they could have found a ‘neutral’ country somewhere in world where they could have put him through a proper trial. This should have been arranged far before they started ‘hunting him down’. That being said – and I know that my view will be very unpopular – but I believe that killing is wrong on any level. I don’t know how they could have done this – but hunting down the man and killing him will only intensify the hate. We are already seeing this with the ‘rejoicing’ in the U.S.. I quote Martin Luther King, Jr.: “I mourn the loss of thousands of precious lives, but I will not rejoice in the death of one, not even an enemy. Returning hate for hate multiplies hate, adding deeper darkness to a night already devoid of stars. Darkness cannot drive out darkness: only light can do that. Hate cannot drive out hate: only love can do that.” I agree 100%. I guess I missed the footnote after the commandment “Thou shalt not kill”. I guess the tiny print said, “Terrorists are excluded and may be killed with God’s blessing.”. Osama bin laden is not dead, and for a man who is well educated and wise, you actually believe what the media tells you. i thought by now the Americans had opened their eyes when they saw Bush doing as he pleased, not for his people not for his land, but only for his wealth and reputation. the day before bin laden was pronounced dead, Obama struck war crime in Libya, killing Gaddafi son and his granchildren. and everyone knows a war crime is punishable by prison sentance or if you was in another country, than by death. therefore Obama had to cover up his wrong deeds, which he did ever so well by telling the world he has captured the most hated man in the world. i believe not, as for my understanding when Saddam died he was exposed to the world, up until his death where they hung him, I had watched it all. they did this so the world knew the americans had finally got saddam. why do they not do this for bin laden. I’ll tell you why, because they don’t have him. Obama expalin he does not want to upset bin laden supporters. this is really pathetic, when did the president ever think of anyone else other than himself.